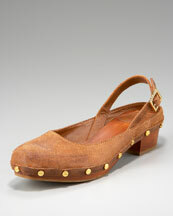 I'm getting increasingly excited about buying clogs! Tory Burch's "Alexander," is a good example of the reason why. low-heeled, stud detail, saddle tan with that "worn" look and uniquely designed to boot....I love it! I consider the $275 price tag reasonable, as I know that I would get a great deal of wear out of them. They would be the perfect addition to jean cutoffs and a tank; I would also wear them with skinny jeans and a leather jacket for fall. oh, the endless possibilities!